The Bank of England over the past 4 years has effectively stuffed every bankster orifice with tax payer cash through a multitude of measures that include insuring toxic assets, direct capital injections, loans, transference of bad assets off bank balance sheets (such as Northern Rock) and QE money printing to buy assets owned by banks all as a consequence of the Fear of Financial Armageddon as I touched upon in depth in the Interest Rate Mega-trend ebook of March 2011 (FREE DOWNLOAD). 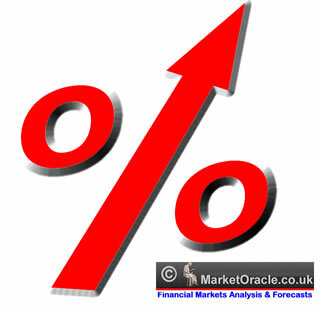 13 Mar 12, 06:14 UK House Prices going up???? If interest rates rise (more expensive repayments) yet average wages are stagnant or below inflation doesn't that put downward pressure on house prices? Look forward to more indepth analysis. Firstly, thank you for your article. B) How long do you expect this stocks stealth bull market to last for? Is this a secular bull market or just a cyclical 3-5 year bull? Do you still forsee a correction in April/May 2012 or something a little bigger? Simon B - the reasons will become clear in hindsight after the bull market has run for several years, which is why bull markets are missed for several years. Ben - The base interest rate is irrelvant to the retail market, the market is alreay operating as if the base interest rate was at least 3%. Which means it won't make any difference to the market when rates rise INFACT I would not be suprised if market rates fell when the base rate rises. Stocks Bull - No such thing as secular or cyclical, its either a bull market or a bear market or a trading range (approx 30% of the time) ... I will do analyse on stocks late April to know what will probably transpire during May etc. With the average house prices around 6 times average income surely the only way house prices can move up from here, in the absence of large deposits, is if the banks start lending 7 or 8 times income which I just cannot see happening. Here in Lincolnshire, the housing market seems at an impasse as sellers do not want to drop prices and wannabe buyers cannot secure the credit and cannot afford to save large deposits. Do you think this stalemate will be resolved via inflation? Many thanks for the articles! At the start of every bull market there are always plenty of logical reasons why it cannot rise, the real reason will not become clear to most for many years. Luckily, I already have good idea what the real reasosns 'probably' are and will write at length over the coming weeks. Hi Nadeem i've noticed that many of the homebuilders have completed base patterns, and in america the iyr an real estate index is completing a masive reverse head and shoulders pattern,have you noticed this? 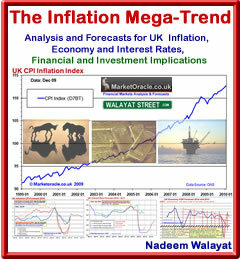 The pieces of the puzzle are falling into place and are supportive of a trend towards real term rises in house prices, my best indicaton is that 2013 will see real term rises in house prices, but more on this after Ive done some 20 seperate and often conflicting pieces of puzzle analysis. 16 Mar 12, 08:23 Bull market in 'nominal' term but Bear in 'real' term. Do you mean there will be a 'Bull market' on the basis that our currency will continue to debase? However, if we are to measure our house prices in Gold and perhaps Oil, this is going to be a 'Bear market'. Do you see money supply being pushed up (hence loan rates rising) which is bullish for asset/house prices? 22 Mar 12, 16:22 Que ? What has the base rate got to do with anything ? Banks are being encouraged to lend money to keep the debt-ponzi economy ticking over as the alternative is debts defaulted on, and the 0.5% is part of the BoE's encouragement to lend. The SLS is finished, remember. House prices will erode (because immigration / demand is still there but available credit - and unlimited housing benefit that underwrote the BTL game - is not) until Labour demagogues get back in power in 3 years time, as people will be sick of the Coalition and their cuts by then. Rates will subsequently shoot up as the market bricks itself and the long overdue property 'correction / crash' will come. This is fairly obvious to anyone that isn't a property ramper. 23 Mar 12, 02:33 Property ramper ? How can I be a property ramper when Ive been bearish from August 2007 to August 2011. Probability is increasingly favouring rising prices, yes it will be missed by most for many years as is usually the case. ''At the start of every bull market there are always plenty of logical reasons why it cannot rise, the real reason will not become clear to most for many years. Do you care to share with us what are the real reasons behind your thinking. My aim is to do a series of articles to arrive at a probable trend for many years. My indicators say rising prices, but not to what degree, which is what detailed analysis will conclude towards. But first I need to get the NHS which is bankrupting Britain out of my system. A good response that has me pondering my own line of thinking. The financial reality versus political acceptance. The downside is the game is closing in and to strip the UK of such generous benefits causes the masses to rise against the hand that feeds them. That is the concern that the Powers that be are really concerned about, and has always been throughout history. im afraid im with nadeem on this one. The immigration issue is a major matter, the world is not the one we lived in 25 years ago and a lot of wealth will find its way into London from not just Asia's rich but Asia's expanding middle class. Im not confident this is good for the country ie if you are employed and from say NW England you are being taxed to the hilte to subsidise an anti crash standoff to avoid something that no politician wants on their watch. When you compare how attractive London is to people from overseas (and not just as investors) then you can see why the population will rise to 75m+ within less than a generation. When I say that, think how much of a welcome you get in other parts of the world if you are foreign, France being a very good example. There is employment for allcomers in London and everything else that is attractive for them - except housing.